Added by laforge about 1 year ago. Updated 6 months ago. The way how the current measurement processing code is implemented, it simply counts the amount of reported measurements during the measurement period and then builds the average. This misses the fact that there should always be a well-defined number of measurements within each measurement period (SACCH multiframe). If there are any measurements missing, it means that bursts were missing, and hence those missing bursts should be substituted with 100% BER. As a result, we want to report the average bit error over all bursts/blocks, not just over those that we have received on L1SAP. lower layers may for whatever reason drop bursts/blocks (e.g. CPU overload). Note that the recent handover patches for osmo-bsc fix an issue that sounds just like this, in osmo-bsc. Thanks, but I somehow fail to understand how something in OsmoBSC can fix / work around a problem in OsmoBTS? difference between the real BER and the BER reported by OsmoBSC. Not per se of course, just as a reference how the averaging was broken and fixed in the BSC until recently. Maybe the BTS code has similar errors. All I'm saying is, maybe it helps to compare the BSC patch to the BTS code base. Sounds like it is a similar bug as in BSC, where invalid measurement reports were still counted as N, so that dividing by N later gives a too low average. I had now a look at the source code and also did some experiments (USRP was not available, so I used OCTBTS). There are a couple of open questions, which I have difficulties with. My main problem is to understand how many measurements we do expect at all. For a TCH/F this should be 26 and for a TCH/H we should get 13 (?). However it should be a fixed number, which is always the same for each channel type. My experiments with OCTBTS give me measurement counts of 13, 24, 25, 23. At least during the call when I am on TCH/H i would have expected to see 26 measurements. Also as far as I understand the measurement we get from the mobile always covers an interval of frames. How can we conclude 100%BER if we miss measurement frames?. A missing measurement simply could mean that just the SDCCH frame was missing and the other frames were correct?. My idea is as follows: When a measurement period done and the RSL measurement result is computed, then we check how many measurements were collected. If measurements are missing we pad them with 100%BER measurements and proceed with the computation. The interface between the bts-specific part and the common part works on blocks, not bursts. The measurement reporting interval is 102 or 104 frames (depending on TCH vs. SDCCH). That's basically 26*4 = 104 (TCH) or 51*2 = 102 (SDCCH). i.e. a total of 25 measurements. For TCH/H, you can do the computation yourself if you look at the definition of TCH/H. Also as far as I understand the measurement we get from the mobile always covers an interval of frames. 102/104 frame period described above. How can we conclude 100%BER if we miss measurement frames?. A missing measurement simply could mean that just the SDCCH frame was missing and the other frames were correct?. I'm not following you. Are you referring to uplink or downlink measurements? Are you referring to SACCH (/H, /F) or SDCCH as you wrote? It seems to be related to the problem, which most likely is the reason of OS#2700. dexter: Following up on our conversation on Thursday: I just re-read that for TCH/H, a voice block (codec frame) is produced every two blocks, while a FACCH frame will take four blocks, i.e. silence/drop two voice blocks (codec frame). Do you mean that a voice frame consists of 2 TDMA frames (a half-block so to say)? I found that in the osmo-bts code but I was unable to confirm this with the spec. It would be good if you could give me a pointer where you found it. I fixed the calculation now that it matches the description above. I am currently writing unit-tests to check it. Do you mean that a voice frame consists of 2 TDMA frames (a half-block so to say)? I found that in the osmo-bts code but I was unable to confirm this with the spec. Please have a look at https://osmocom.org/issues/3419, there are some details about TCH/H. whole 4 bursts, the 'block diagonal' interleaving is used for both TCH/F and TCH/H. current speech frame, and 57 bits of the previous one. FACCH/F frame steals (i.e. 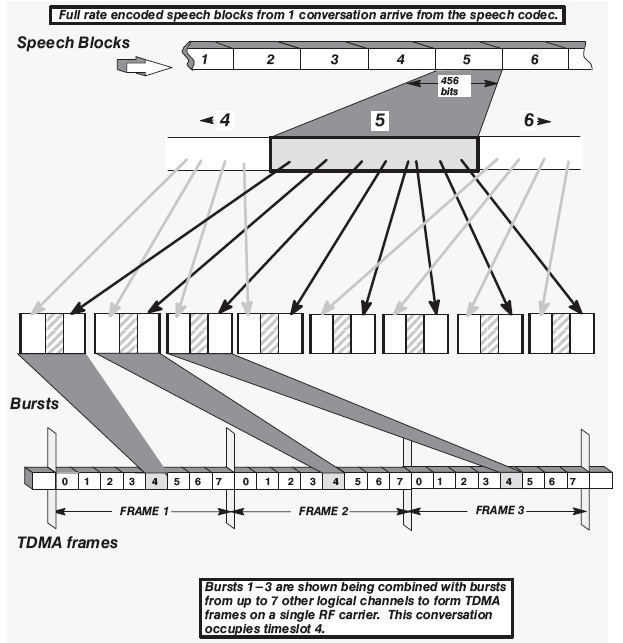 replaces) one TCH/F speech frame, but being encoded same as given for TCH/F. So, every 4th burst you decode either a FCH/F speech, or a FACCH/F frame. and mapping is different from TCH/H. Please see the issue I referenced above. each burst are actual for the last speech frame and the current at the same time. thanks for pointing that out. Now the interleaved block mapping that is described in Also see 3GPP TS 05.02 Clause 7 Table 1 of 9 makes sense to me. So in a TCH/F every four TDMA frames we finish one voice frame and in TCH/H we finish one every two TDMA frames. Thats exactly what is in scheduler.c of osmo-bts. But I still don't know if this also means that the measurement results come in the same intervals. It would make sense, same amount of measurement points for both channel types, but I am still not sure. I have pushed my current state to pmaier/measurement_13082018 To me it looks quite right, but I still have to get my head around the STDCCH4/8. I probably should also check if the calculation is right. At the moment I just trust the code that is there. But I still don't know if this also means that the measurement results come in the same intervals. It would make sense, same amount of measurement points for both channel types, but I am still not sure. THe way our L1SAP interface is structured (and the way the sysmobts, lc15, octphy PHYs are structured), you get one (average) measurement over all the bursts comprising one block reported together with the PH-DATA.ind. In osmo-bts-trx, this averaging is performed below l1sap, as we receive one measurement withe very burst. Above L1SAP, all BTS models are unified. This means that I should get 3 measurements per user in one interval. When I try it out on osmo-bts this seems to match but I also see intervals that only get back with 2 or even only 1 measurements. Tue Aug 14 18:02:54 2018 <0000> rsl.c:1036 (bts=0,trx=0,ts=0,ss=0): rx Channel Activation in state: NONE. Are there also some DTX rules to apply to SDCCH channels? I think no, the amount of measurement data would be a bit low. We only have 3 blocks there and reducing it even more seems not to be desirable, but I am not sure. So probably those missing blocks are just lost? This means that I should get 3 measurements per user in one interval. that is my understanding, too. When I try it out on osmo-bts this seems to match but I also see intervals that only get back with 2 or even only 1 measurements. I think DTX is not permitted on SDCCH. I think this was explicitly mentioned in one of the related 05.02 / 05.03 or so specs. I have now put the change to gerrit so we can do some review: https://gerrit.osmocom.org/#/c/osmo-bts/+/10476/ However, there are still some open questions. I am confident that the intervals now work, but the computed results are now different of course. The TOA256 stuff should yield correct results, but I am not sure. I have changed the unit-tests for that a bit so that it gets full measurements. Otherwise the results would look odd and it is probably not a realistic testcase when there are only three measurement samples. When we miss a measurement sample, we set .ta_offs_256bits = 0. Is this correct? To me it looks like if we were messing up the average with this. That's a good point. Not sure what is "right" here. We simply don't know the timing. min/max/avg. Not sure how easy this is in the current code structure. I have checked the status on how ta_offs_256bits is currently used in the computation. In measurement.c:lchan_meas_check_compute() one can see that ta256b_sum += m->ta_offs_256bits; is only executed when i < lchan->meas.num_ul_meas. This means only real ta_offs_256bits go into the computation. So from that perspective we should be fine now. We also decided only to use the m->inv_rssi from the real measurements at some point. The code currently computes ta256b_sum += m->ta_offs_256bits; i < lchan->meas.num_ul_meas. I wonder if this was a good idea since this again messes up the average. If many measurements are missing we still would get a good rssi value. This is probably not right and we should move ta256b_sum += m->ta_offs_256bits; a few lines below that it is executed for all computation rounds. The computation of ber_full_sum += m->ber10k; looks good. Here we also include the made up measurements with 100% BER. This should give a realistic average. Also the following code if (is_sub)... looks ok to me.